Congratulations! You’re finally engaged, and on your way to spending the rest of your life with your one true love. That’s cause for some major celebrations, which is why you should definitely consider having an engagement party. A great engagement party will get guests excited for your wedding, inviting them to share the love that you share with your future spouse. And a creative engagement party theme is the perfect way to impress your guests. Luckily, the pros at De Luxe Banquet Hall are here with a few fun engagement party theme ideas. Read on for some of our suggestions below! If you want to have an intimate wedding reception, it’s a good idea to also have an intimate engagement party. And one great way to incorporate that style is with a wine tasting engagement party. Wine tastings are always classy events, allowing guests to mingle and unwind with some delicious drinks. We recommend a wine tasting party if you have a lot of guests that don’t know each other, as the chill vibe and intimate atmosphere will definitely provide them time to get to know each other. Most big parties are evening affairs, with guests celebrating and partying the night away. But if you’re looking to for something different, why not organize a great catered brunch for your engagement party? Everyone loves brunch, and providing guests with some delicious food will definitely impress. You can likely make a reservation at a great local restaurant or have a catering service bring brunch to your home or event venue, providing guests with a comfortable, relaxed party that will get them excited for your wedding. Luckily, De Luxe Banquet Hall offers world-class catering that can provide anything you request! Your wedding is bound to have at least a few kids in attendances, so why not get them involved in the festivities from the start? If your wedding guests have kids, then you might want to consider having an all-ages engagement party. An all-ages party is a great way to get your entire family involved in the festivities, from grandparents and teens to toddlers! 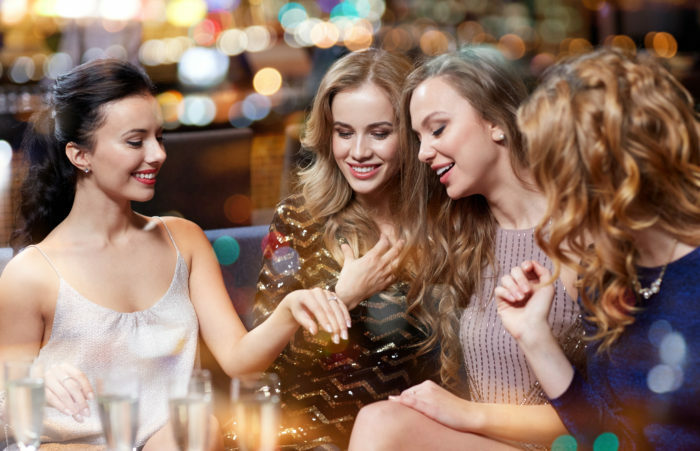 You can organize this party more or less the same as any other engagement celebration, but we recommend incorporating some special activities or entertainment for your younger guests. Celebrating your engagement can be an expensive affair, and if you’re looking to cut some costs you should consider having a DIY engagement party. There are plenty of DIY party planning tips available online to help you get started, and we’d recommend designing some of your own decorations and cooking up your own food for the event. It might be a lot of work, but doing all that work yourself will definitely help you cut the cost. It’s always fun to incorporate seasonal elements into your event, and a great way to celebrate your engagement is with an outdoor barbecue picnic! Nothing beats gathering all your friends and family for a day of fun in the sun, complete with some delicious catering. Your engagement deserves just as much celebration as your wedding, and with a little creative planning you’re pound to have a successful engagement party. And if you’re looking for a great engagement party venue in Los Angeles, you should consider De Luxe Banquet Hall. Our event venues are perfect for engagement celebrations, wedding receptions, and so much more. Even better, we can meet almost any budget, guaranteeing you don’t overspend on your event. For more information on booking and availability, contact De Luxe Banquet Hall today.